Santi Cazorla, goal poacher. Might not be the story of the season but it was for the week, devastating any team without the diminutive Spaniard in the lineup. Elsewhere, City played like City of old offensively and the Red Devils continued to roll on. On to this week’s numbers. 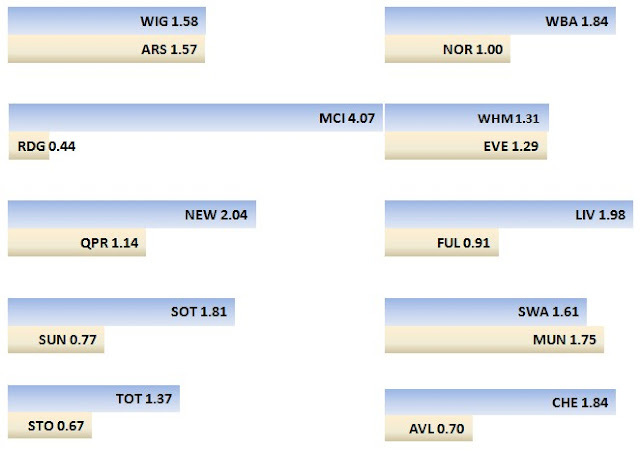 Some very impressive performances this week by Arsenal and Man United. Both offensive outputs were well deserved, as was City’s impressive output against Newcastle. Fulham continued their offensive struggles without Ruiz in the lineup. 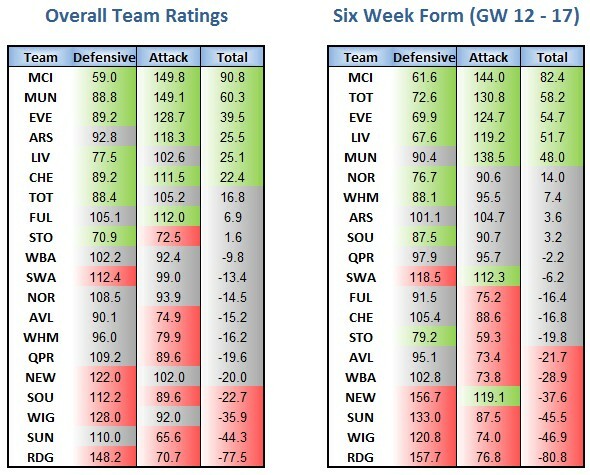 As mentioned, Arsenal and United were absolutely dominant this week. Villa were fortunate to score three times, but they did manage 6 shots on target and two Big Chances against an elite defence on the road. They do need to get more shots in the box moving forward unless Benteke plans on putting on world class performances every week. QPR stifled Fulham and deserved a clean sheet, although one wonders how much quality Fulham have with Ruiz out and Kacaniklic on the bench. West Brom were all over the attacking third but unable to generate any real chances against Allardyce’s club. Elsewhere in London, AVB has Spurs clicking as their defence has risen to a virtual tie for fourth with Man U., Chelsea and Everton. Struggling to keep your job after a nearly two years of success? Schedule a game against Reading! Same goes for Handsome Harry with his first win for QPR. As discussed, Spurs are playing very well recently and seem to be serious contenders for a Champions League spot. See notes above regarding Fulham’s and West Brom’s struggles. Swansea surprisingly struggled to generate any offense against Spurs after being in very strong attacking form recently. 19 shots in the box, twelve shots on target, six Big Chances. Defensive performances don’t get much worse than that. Arsenal deserved every last one of their five tallies. Sunderland not surprisingly struggled against Man U, but the ten Big Chances accounted by the Red Devils was a season high for any club by over 40 percent. United probably deserved another goal or two. Note this was the exact same headline last week. Reading has now fallen 17.3 rating points in two weeks. That by itself is troublesome, but they were already the worst team in the league by almost 28 points BEFORE the two week drop! Relegation seems an absolute certainty at this point. It will also probably be awhile before Brendan Rodgers talks about UCL qualification again. Will Sturridge help? Possibly. More on that shortly. Wigan’s 2-1 defeat at Carrow Road looks much worse on the stat sheet. - The rumoured signing of Daniel Sturridge for Liverpool is interesting. While his pace and skill is sorely needed in the Reds attack, it’s not clear to me he fills the need of a true #9. It will be interesting to see how Rodgers integrates him into the squad should the deal come to fruition. - As mentioned, AVB has Spurs purring. They are now up to second in the six week form and have been superb at both ends of the pitch. I personally have been too harsh on the former Chelsea and Porto coach. - Manchester United have almost eclipsed Manchester City in attacking rankings. Adding in their world class striker duo you’ve got one hell of an attack. - Could Newcastle be a relegation candidate? Seemed unlikely two months ago but they have struggled recently. Should Ba be gone in December things might get dicey.